a relationship with a famous person. I this case it is a linkage to the famous Dutch painter Rembrandt Harmenszoon van Rijn - it may be far-fetched, but non-theless very worthy of mentioning. Hester Johannes van Loo was my mother's 9th great-grandmother. She was one of 8 children - among her siblings a brother Gerrit Johannes van Loo, which would then be my 10th great-grand-uncle. Gerrit, or also Gerard van Loo, was a lawyer and secretary in the grietenij Het Bildt. On Sept. 23, 1627 Gerrit entered into his second marriage with Hisck (Hiskje) van Uylenburgh, a daughter of Sjoukje Ozinga and Rombertus van Uylenburgh, who was a top lawyer, a town mayor, and one of the founders of the University of Franeker. In 1624, after the death of his father-in-law and mother-in-law, Gerrit became the guardian of his wife's underage siblings, Titia Uylenburgh, Edzert Ulenburgh, Saskia Uylenburgh, who was 12 years old at this time, and who later married the famous Dutch painter Rembrandt Harmenszoon van Rijn, who was the son of a wealthy miller from Leiden. In 1631, in the company of the Mennonite painters Govert Flinck and Jacob Backer, Saskia traveled to Amsterdam. Supposedly Saskia Uylenburgh met Rembrandt there, at the home of her uncle, Hendrick van Uylenburgh, a painter and art dealer. Rembrandt produced paintings and portraits for Uylenburgh's Amsterdam clients. In turn Rembrandt travelled to Leeuwarden, where he was received by the painter Wybrand de Geest, who had married Saskia's niece, Marina Watts. For a while Saskia lived in Franeker when her sister Antje was ill. After Antje's burial, Saskia assisted her brother-in-law, the Polish theology professor Johannes Maccovius, until she married Rembrandt in 1634. Saskia and Rembrandt were engaged in 1633, and on 10 June 1634 Rembrandt asked permission to marry in Sint Annaparochie. He showed his mother's written consent to the schepen. On 2 July the couple married. The preacher was Saskia's cousin, but evidently none of Rembrandt's family attended the marriage. That Saskia fell in love with an artist who was socially no match for the daughter of a patrician and that she pressed for a speedy betrothal against all conventions certainly shows that she was a very strong and independent character. In 1635 the couple moved to one of the posh streets in Amsterdam, the Nieuwe Doelenstraat, with prominent neighbors and a view of the river Amstel. Rembrandt gained financial success through his artwork, and decided in 1639 to buy a house in the Jodenbreestraat, next to the place where he worked. A year before, by July 16, 1638, Sas kia's Friesian relatives complained that Saskia was spoiling her inheritance. Rembrandt asked his brother-in-law Ulricus van Uylenburgh, also a lawyer, to help them out, confirming he was successful and able to pay for the house. Three of their children died shortly after birth and were buried in the nearby Zuiderkerk. The sole survivor was Titus, who was named after his mother's sister Titia (Tietje) van Uylenburgh. Saskia died the year after he was born, aged 29, probably from tuberculosis. She was buried in the Oude Kerk. So I am not really related to Rembrandt - but there is a connection. I was working on this kit today - this kit includes a printed, heavy cardstock. I decided how many names I wanted to include on this chart, and then glued the cardboard ovals where I wanted them. (I wish I had perfect writing or the ability to calligraphy, but I can't - however I read once that you should use your handwriting - in a 100 years your ancestors will be so happy to have something handwritten by you) So with my best handwriting I filled in all the names. I then decided to add all the portraits of my ancestors, which I all printed out in sepia and cut them all out with an oval punch. We went for a drive yesterday, and we found this piece of old-time farm machinery. It stood among an old plow, a hay rake, a mower and a few other pieces. Even my husband, a farmer, was unable to identify it. Any Ideas?? Again we come to that special day of the year when we celebrate Mother's Day. Julia Ward Howe was the first to proclaim Mother's Day in 1870. Her Mother's Day Proclamation was a pacifist reaction to the American Civil War and the Franco-Prussian War. The modern holiday of Mother's Day was first celebrated in 1908, when Anna Jarvis held a memorial for her mother in America. She then began a cam paign to make "Mother's Day" a recognized holiday in the United States. Although she was successful in 1914, she was already disappointed with its commercialization by the 1920s. Jarvis' holiday was adopted by other countries and it's now celebrated all over the world. (Wikipedia - http://en.wikipedia.org/wiki/Mother's_Day ) Like any mother, I do appreciate the extra attention lavished on me on this day - but it is also a time to reflect on motherhood - being a mother and the priviledge it is to be a mother. I thank God for my children and the great relationship I have with each one of them. I also remember my mother (Dirkje (left) 1936-2001)who has passed a few years ago at the age of 66, and my mother-in-law (Anna (right) 1934-2001) who passed away in the same year as my own mother at the age of 69. Both of these women were great ladies of faith, and an example to me and my children. So to all you children - young and old, appreciate your mothers while you still can. stand up and take responsibility for our actions. yogurt, or guys wearing earrings. say there is a generation gap... and how old do you think I am? What has changed since you were young ? This particular branch of the family tree were Silversmiths. Klaas Jansen Heixan was born on August 11, 1678 in Dokkum, Friesland, and like his father also became a silversmith. Every silversmith in those days had his own sign, or seal, to mark his work. 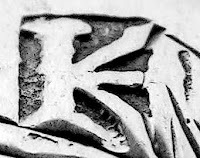 I found his sign, the KH monogram, at Meestertekens van Friese goud- en zilversmeden, werkzaam in de periode van ca. 1700 tot 1812 (Masterseals from Friesian gold- and silversmiths that were working between 1700 to1812) Not only did I find his 'signature', a sign that he placed on every piece of silverware he created, I also found a picture of a piece he made. At the following site, Botma Genealogy I found the family crest of a family Botma, at the bottom of a seal, which is part of a pipe stamper and other helpful tools. The initials G.G.B, are that of the owner. Upon closer inspection you can see the silver mark of the maker. On this website you can read the following: "Gezien het zilvermerk is het werktuig gemaakt door de Dokkumer Klaas Heixan. Deze stond ingeschreven in het gildeboek van 1704 tot 1738'. 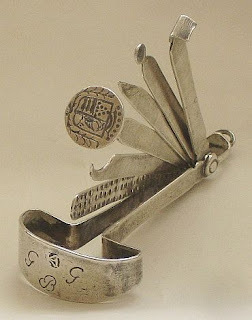 So, t o think that one of my ancestors (even though it was long ago), created this piece from silver, somewhere in the 1700's. It is like finding a little piece of my history. When looking for my ancestors, sometimes I rely on the research some others have done on that same branch. Just 'google' the name you are looking for and add a bit of information while you are surfing, like; 'Heixan, Klaas ,silversmith ' that is how I found this picture and some more information to help me on my search. Do not forget to credit the site where you got your information. There are 12 steps to keep you organized when making a family tree. 1. Gather all the supplies for your project. You will need file boxes with lids, colored hanging file folders, standard green hanging files, manila folders, pens, highlighters, labels for folders, dot or star stickers, lined paper, additional boxes to expand your storage, a carrying case to hold all of this in, and a wall size pedigree chart. Pedigree charts can be found on most ancestry websites or at your local library. Print a color copy of the Circled 5 Generation Pedigree Chart. You are the 5th generation. Your sixteen great grandparents are the first generation. Use the color code provided with the chart to fill in the rest. This chart can be found at most genealogy websites. This step needs no explanation. Just place 16 hanging file folders in your box. You may need more later on but 16 is the basic you will need for all your great grandparents. 6. Label the colored hanging file folders with your family surnames. Label each of the folders with the surname of each of your 8 great grandfathers, and the maiden names of your 8 great grandmothers. If you don't know the surnames (last names) of your great grandmothers, do as many as you can and try to contact family members that may know other names. 7. Put a highlighted copy of your 5-generation pedigree chart in each of the colored folders. 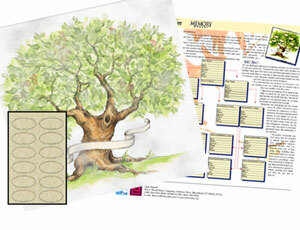 Print 16 more copies of your 5-generation pedigree chart with you as 1 on the chart. On one of the pedigree charts, highlight the names of all persons with the same last name using the color assigned to that last name. File the highlighted pedigree chart in its last name hanging file folder. Repeat the process of highlighting a last name line and filing the pedigree chart in its hanging folder for each of the 16 last names of your great-great grandparents. This may seem tedious, but you will appreciate how much easier it makes things later. 8. Set up a file for each family on your 5-generation pedigree chart. Set up manila folders for each of the families by putting a colored labels on the file tab. Match the label color to the color of each family group record. Be sure to use sticky labels. Sticky labels are great because if you have to change something, you just place a label over the existing one. They help keep things organized. Place the manila family folders in hanging folders, matching the color of the label on the manila family folder to the color of the hanging file folder. Color coding everything makes things so much easier to find later. In a family folder place the family group record of the family, documents you have already gathered for that family, and any notes you have taken on the family. Set up other files containing letters, photos, emails, birth certificates, etc. Anything that you can think of that may fit into its own category, make a file for it. It makes it much easier to locate later. When one of your files gets too big to fit into your box, simply move it to another box. Take as many boxes as you need to get all the information you need. Having multiple organized boxes is much better than having it all in one box unorganized and a jumbled mess. Following these easy steps will help keep you organized while creating your family tree. With such a big undertaking, organization is important.